ROME (AP).- Caravaggio was notorious for his brawling, so it might be fitting that a claim by two Italian art historians that they discovered as many as 100 drawings by the painter in his boyhood has sparked an art world uproar. The researchers say they found dozens of early drawings by Caravaggio in the collection of master Milanese artist Simone Peterzano, the painter’s teacher from 1584 to 1588. Many experts have responded with skepticism to the startling claim: Over the centuries, art historians have never definitively attributed any drawings to Caravaggio, who shook up 16th-century art by using models from the lower walks of life for religious scenes and dramatically counterpointing light and dark. 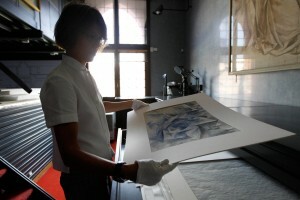 On Friday, the curator of the drawings collection at Milan’s Sforzesco Castle, where the collection of 1,500 paintings generally attributed to Peterzano is kept, challenged the seriousness of the researchers’ methods and contended that the pair had never set foot in the room to scrutinize the works. “We would be happy to have a Caravaggio,” Francesco Rossi said, cautioning that it’s difficult to be sure of the works’ provenance. Making it especially difficult to pin works on Caravaggio was the artist’s habit of not signing his own work. Attempts at fakes and uncertain claims of authenticity have been frequent. He dismissed the historians’ methods as naive. The researchers defended their claim, which they made public on Thursday in an interview with the Italian news agency ANSA. Adriana Conconi Fedrigolli, told the AP in a phone interview that some of their research team studied the drawings firsthand. When pressed to identify the other researchers, she said she wasn’t authorized to reveal their names and passed the phone to the other art historian, Maurizio Bernardelli Curuz. “I saw the originals,” Bernadelli Curuz said. The art historian said he was able to visit the collection “after hours,” thanks to his contacts with a high-level city official who was authorized to enter the drawings department. He declined to identify the city official. But he insisted that he and Conconi Fedrigolli worked “in a very scientific way” using photos of the drawings and comparing details to those in well-known Caravaggio works. He said it was not logical that among the Peterzano collection drawings there wouldn’t be any by Caravaggio, a star pupil then known as Michelangelo Merisi. The artist is better known by the name of the Italian town where he was born. He contended they were able to distinguish drawings by Peterzano from those of his pupils, including Caravaggio. Paolucci described the claim as “pure inductive optimism” in the Vatican newspaper L’Osservatore Romano on Friday, though he acknowledged it was always possible that “researchers with lesser credentials but with an especially gifted eye, sensitivity and also luck” had pinpointed something new. Paolucci has experienced first-hand the perils of attributing works to great artists, particularly Caravaggio. Two summers ago, the Vatican Museums director wrote an article under the headline “A New Caravaggio? Not really,” a week after the Vatican newspaper first suggested that a painting depicting St. Lawrence could be that of Caravaggio — but then backtracked.